Working long hours? We get you. Having recently finished up a trial that had us at the office in the wee-est of hours, we can commiserate over the exhaustion that arises from fitting two weeks’ worth of work into one. Deadlines must be met but workers must also be fairly compensated for their lost free and family time. Overtime starts for most employees after working 44 hours in a work week (regardless if their employment status is full- or part-time, or casual). After 44 hours of work in a week, they must receive at least time and a half for each extra hour they work (1.5 times their normal wages). Unless explicitly agreed to in the employment contract, overtime is not calculated daily. This means that an employee could work 11 hours in one day and not receive time and a half after their initial eight hours on the job so long as over the course of the week they do not exceed 44 hours of work. There are, however, several exceptions to overtime standards. Managers and supervisors, for example, are not covered by overtime rules. While calling more members of your staff by these titles to avoid paying them overtime may seem like a sneaky way to save your business money, simply calling an employee a manager or supervisor does not make it so. Only people with the authority to hire, fire and grant time off to employees, and who participate in business and operations-level decision making are considered managers when it comes to overtime entitlements. The employee has the day off and receives public holiday pay. 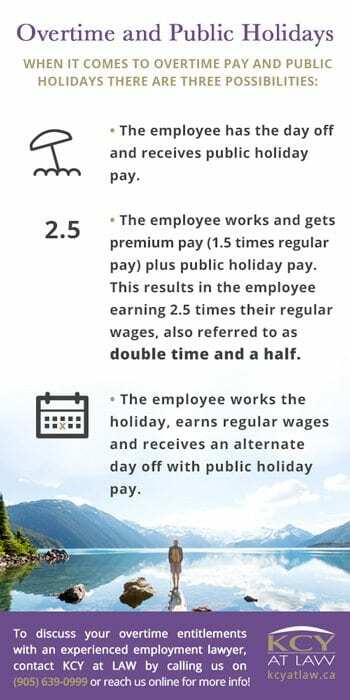 The employee works and gets premium pay (1.5 times regular pay) plus public holiday pay. This results in the employee earning 2.5 times their regular wages, also referred to as double time and a half. The employee works the holiday, earns regular wages and receives an alternate day off with public holiday pay. There is some variation in how overtime pay is calculated depending on how the employee is paid (hourly, commission, salaried, etc.). However, the basic principle that the employee’s average hourly wage is multiplied by 1.5 for every hour they work after 44 hours in a week remains consistent. Below are some examples of what that can look like. Daphne’s regular hourly wage is $16. She worked 48 hours this week meaning she worked 4 hours overtime. 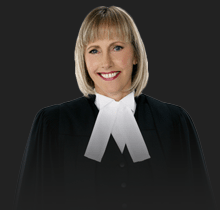 Therefore, Daphne is entitled to an additional $96 to her regular weeks’ wages of $704 (44 hours x $16 = $704) for a total earning of $800. For an employee working an hourly rate plus commission, their overtime rate is calculated by taking their total week’s earnings (including commissions) and dividing it by the regular number of hours (44) to establish what would be their hourly wage and therefore the wage that will be used to calculate overtime pay. So, if Frieda worked 50 hours last week and earned $400 commission in addition to her $12 per hour wage she would be entitled to $180 in overtime pay in addition to her $1000 wages (50 hours x $12 = $600 + $400 = $1000) for a total earning of $1180. Similarly, for an employee with a fixed salary you must divide their weekly salary by 44 (hours) to get the hourly rate you will use to calculate their overtime pay. Harriet is paid a weekly salary of $1,500. She worked 46 hours last week and is therefore entitled to $102.27 overtime pay in addition to her regular pay of $1,500 for a total earning of $1,602.27. It is possible as an employee to receive time off instead of overtime pay. This is often referred to as ‘banked time’ and must be agreed to in writing by both employer and employee. 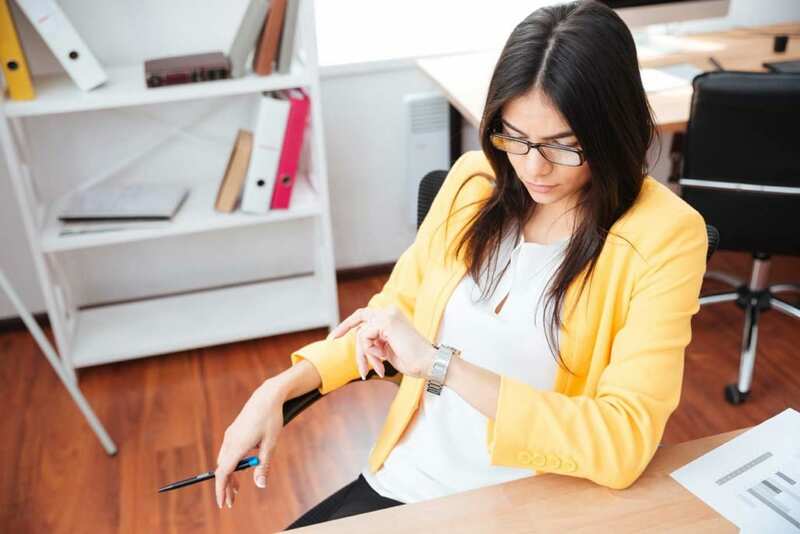 The employee must receive at least 1.5 hours paid time off for each hour of overtime worked within three months of the week in which the overtime occurred or within a year if the employee is agreeable in writing. If the averaging period is three weeks, overtime hours will start to collect after the employee has worked 132 hours (44 hours x 3 weeks = 132 hours) in this period. This means that if an employee with this averaging agreement works 60 hours one week, 50 the next but only 20 the last week of the averaging period, they do not qualify for over hours because the total number of hours they will have worked is only 130 and does not exceed the 132 hour threshold for a three-week averaging period. 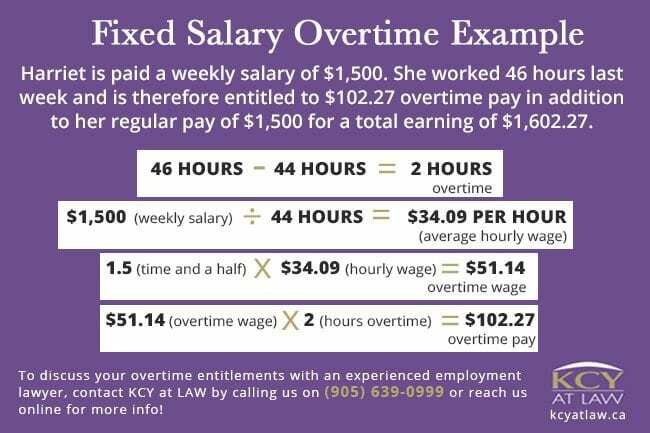 To discuss your overtime entitlements with an experienced employment lawyer, contact KCY at LAW by calling us on (905) 639-0999 or reach us online for more info!